Need accessories for your new kitchen? If you're looking at new kitchens with a view to making over this part of the home, you will likely be in need of kitchen accessories to go with your new units, work surfaces and appliances. Accessories can provide the perfect finishing touch to new kitchens and we offer a wide range of products that can meet a variety of needs. 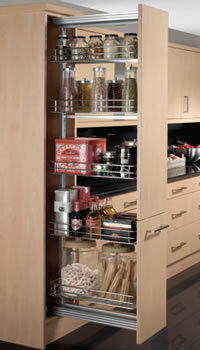 Our range of accessories for kitchens include lighting, rails, pullout storage, utensil dividers, bins and wine racks. As well as being aesthetically pleasing, the right accessories can also make it even easier to cook and socialise in your new kitchen. With research suggesting that families are spending more and more time in their kitchens, buying the right accessories could help to bring you and your children together in this vital part of the home. Roomsense offers a variety of electrical accessories for kitchens, all of which aim to provide convenience and match the colour and design of your new kitchen. We sell hobs ranging from barbecue and deep fat fryer hobs to wok burner and ceramic hobs. If you're looking for a new extractor, our functional yet decorative products could be what you need, while other accessories such as warming drawers, wine cabinets and stylish electrical socket towers provide those extra touches to make cooking in your kitchen easier than ever before. 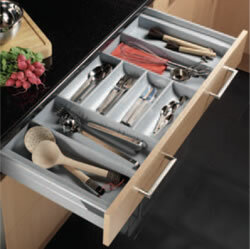 If your cutlery drawer is disorganised, a utensil divider or cutlery insert could be just the thing you need. Our offerings range from products designed to fit the drawers of your new kitchen units perfectly, as well as larger racks and storage solutions for pans and crockery. The kitchen is perhaps the one room in the home that is most in need of effective storage solutions. 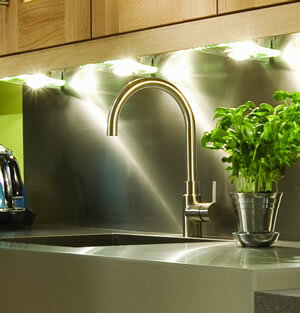 Good kitchen design relies on uncluttered surfaces and unobtrusive storage to provide a clean, unfettered appearance. To achieve this with new kitchens, Roomsense offers a wide range of pullout storage solutions to help you keep bottles, jars, produce, towels, cookware, tins and more besides within easy reach while also remaining safely out of sight when these items are not needed. Our products include wire racks, baskets, rails, pullout larders and carousels to meet the needs of modern kitchens. A good kitchen will make sure the cook always has essentials like paper towels, dishcloths, knives and chopping boards to hand. Our range of rails and racks for kitchens make all of these items available to homeowners by offering ways for them to be hung on the wall or from cupboard doors - saving valuable worktop space in the process. 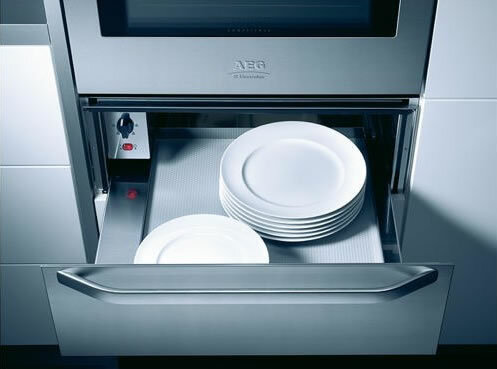 Our other solutions provide easy access to cookbooks and small, miscellaneous items - such as freezer bags and other batteries - that tend to be stashed away in a drawer or on a small shelf. Good lighting is a must in kitchens, as cooks will need to pore over recipe books, keep an eye on their chopping and gauge the state of various ingredients and dishes as they rustle up a meal. Roomsense offers a host of lighting solutions especially for kitchens, including undershelf and overhead lights, as well as mounted downlights, shelf lights and plinth lights. Our designers will make sure you have the lighting you need when they work with you to come up with your dream kitchen design. Our range of accessories for kitchens includes a number of other products - including bins, pullout tables and wine racks - that help to save space and make cooking and cleaning in the kitchen easy and effective. They work with our wide variety of traditional kitchens and contemporary kitchens to offer a fantastic finish and when you look into new kitchens from Roomsense, we'll send experienced designers to your home to make sure you select only the best units, kitchen appliances and kitchen accessories for your needs. If you're interested in kitchens and accessories from Roomsense, please get in touch to find out more.